AMD have today published a measured response to the CTS-Labs report on vulnerabilities in AMD Ryzen CPUs. Rather than attack the low-hanging fruit of the tone and content of said report and website, AMD have specifically acknowledged the security issues outlined in the report. The statement, which can be read below, outlines both the nature of the issues (resulting from firmware flaws and/or 3rd party chipset vulnerabilities) and the exceptional requirements necessary to attempt exploits. For their part, AMD also make it clear that these vulnerabilities are separate from the Spectre vulnerabilities disclosed by Google Project Zero in January, and confirms that they were given less than 24hrs to respond by CTS Labs (an organisation previously unknown to AMD) before they published their white paper. They wisely do not take the authors to task for the rather... unconventional nature of the report. 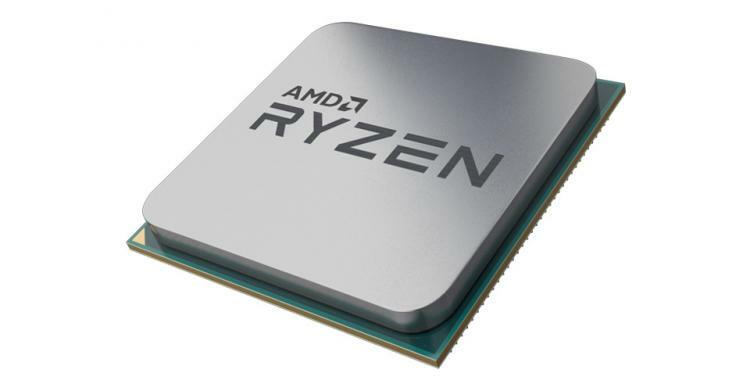 Firmware updates to the Platform Security Processor - issued through BIOS updates - are now being developed to address the issues known as Masterkey, Ryzenfall and Fallout. Given the nature of the affected component it will be no surprise if these updates are put through thorough testing before being rolled out via BIOS update cycles. Chimera meanwhile, a security issue in 3rd party chipsets used by many AM4 and TR4 motherboards, is set to be mitigated by a further BIOS patch. The implication is that AMD require the manufacturer to provide a true fix, and will also work towards that end. It's anticipated that fixes to these issues will have no performance impact. The security issues identified can be grouped into three major categories. 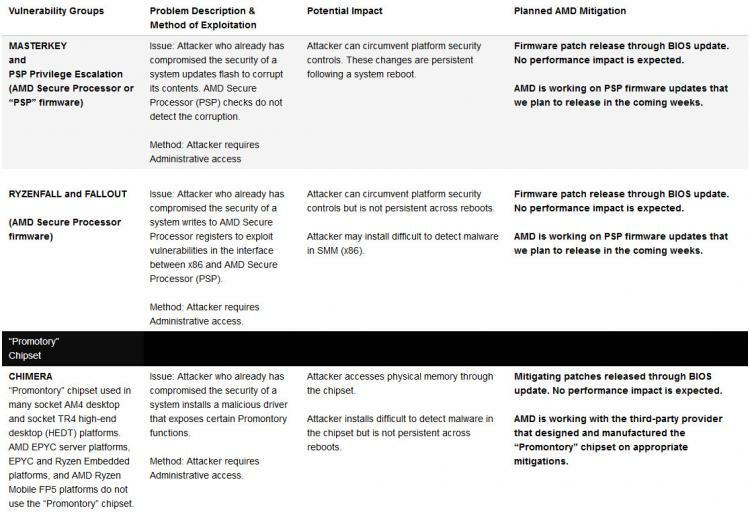 The table [reproduced below] describes the categories, the AMD assessment of impact, and planned actions.